Americans are living longer than ever, meaning that the number of people living to age 100 or older has boomed in recent decades. 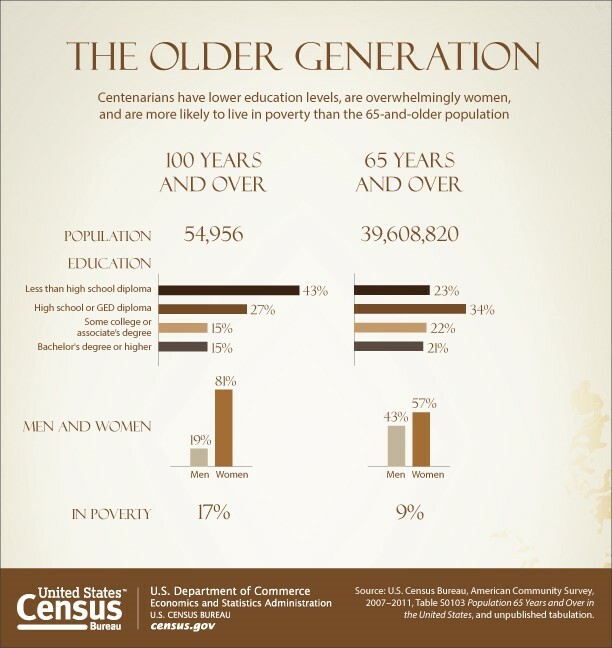 The number of centenarians has grown from around 32,000 in 1980 to 55,000 as of the Census Bureau’s 2007 to 2011 data. That represents a rise of nearly 66 percent over roughly three decades, compared with a 36.3 percent increase for the population overall. 0.02: Percentage of the U.S. population that qualify as “centenarians”-- 100 years old or older. 82.5: Percentage who were white, according to 2010 data.